This aircraft looks exactly like the Curtiss C-1 Flying Boat bought by the Navy in July 1912. It was delivered to the aviation camp on the Severn River across from the Naval Academy in October 1912. Curtiss produced so many different aircraft before 1920 that the various names and numbers can be very confusing and hard to catagorize. 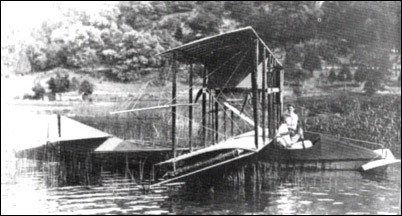 Louis S Casey identifies this flying boat as the first successful flying boat and lables it the Model E. Bowers refers to it as "The Flying Fish." Bowers also describes this version as flying boat number 2. Flying boat number 1, tested at North Island; Curtiss states never got off the water.